A lone photograph can tell a powerful message, but a collection of photographs can tell a story far beyond the abilities of an individual shot. One way to capitalize on this idea in your own photography is to create a series of shots, linked by a particular style or motif. This can be a collection you create all at once or one that you add to over time. 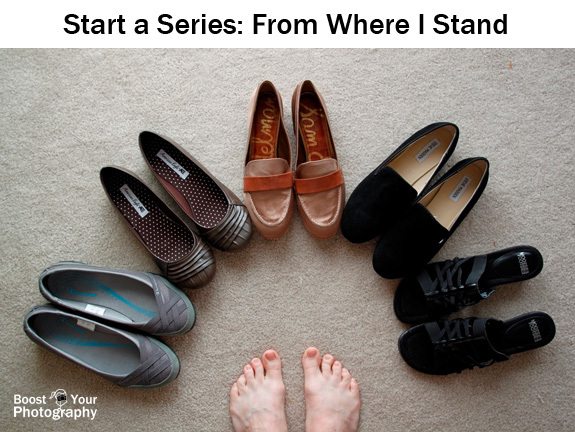 One easy way to start such a series is to begin with something that you always have with you: your own two feet. While the presence of the photographer’s feet in the image can feel like a cliché, it can also be a powerful way of demonstrating your own presence and place in the world. In the image above, the double-brick line marks the original location of the Berlin Wall. 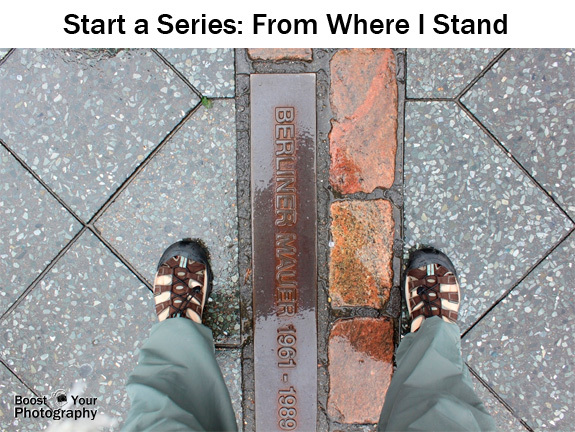 By placing my feet on either side of the line, I am able to interact in that history in a meaningful way. The inclusion of your feet in a picture provides a strong sense of place and can be interesting to explore at various locations. The image above was taken in Belle Fourche, South Dakota, calculated to be the geographic center of the United States. Your feet can also convey information about you and your personality. Personally, I hate shopping for shoes, but last summer I finally gave in and crammed at least a year’s worth of shoe shopping into a single week. To celebrate my accomplishment, I took the above photo, which also has a feeling of indecision to it, as I contemplate all my new options. Such shots can also have a sense of humor. I took this shot above early into my 365 project on a day I had been laid up with a head cold for nearly the entire day. Having been prevented from taking any photographs, I decided to use that to my advantage and set-up the shot to capture my feelings about the day. Finally, collecting a series of repeating shots can make for a great collage. Here, I went for a seasonal theme, including the flowering petals of spring, the dramatic drought of last summer, the first leaves of fall, and a pile up of lake ice during the winter. I also like how the passing of the seasons is reflecting in my shoes as well as my surroundings. So, next time you’re feeling stuck about something to photograph – or are in a new location and want to record your presence – think about looking down. You might be surprised with what you see! Why Won't My Lens Focus? Missed the Shot? Remember "Camera Zero"